Welcome to our older 3-year-olds in the Green Room! It is hard to believe there are only a little over 2 months left to our school year. Our class is full of bright, social and energetic boys and girls who keep Mrs. Kiser and Mrs. Mooney on their toes. They love challenging experiences and opportunities to play with their friends. We begin our day by hanging up our coats and school bags. Next we find our names on the shape and color of the month, place it in the basket so we know who has arrived and to help keep our attendance. When everyone has arrived we have our morning meeting on the rug. We look forward to taking turns being the leader of the day, weather person or in charge of updating the calendar. Next is the Mystery Box where we are given clues as to what is in the box. It may be related to a specific theme that day , math concepts or problem solving activities i.e. matching shapes, opposites, rhyming words, colors, numbers and etc. Many times we solve the mystery before the teacher has time to give all the clues. We have very enthusiastic and smart children in our class. Next is our free play time where we can choose from a variety of materials set out in the room. 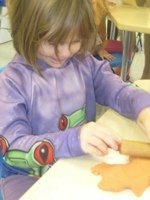 We love the play doh and corn meal/water tables as well as painting or drawing at the easel. Another favorite is building with legos, magnetic and wooden blocks, gears, bristle blocks and etc. Fine motor manipulatives are challenging and fun. Other activities we enjoy are putting together puzzles, dress up and playing in the kitchen with our friends. During this time we enjoy taking turns working one-on-one with a teacher on a special project for that day. This a special time for the teacher to spend individual time with a child and engage them in a conversation. Everyone looks forward to our special classes. On Tuesday is Music with Mrs. Orlando. We love to sing and play instruments ie. Bells, shakers and rhythm sticks. Next is Language Arts with Mrs. Sodano. She works with half the class at a time and when they return to class they love to show the teacher their hand which she stamped and share what they did in her class. On Fridays is gym with Mrs. Kolb. 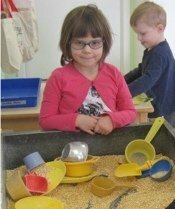 She provides many different types of activities to challenge our gross motor and eye-hand coordination skills as well as our imagination. After cleaning up our room it’s time to get ready for snack. We wash our hands and look for our name at the table. Before eating we thank God for our food and many blessings. We are a very social group and love to spend time talking with our friends while having a yummy snack. When finished eating we clean up our spot and sit quietly on the rug looking at a book. When everyone is done eating our teachers reads a special story to us before getting ready to go home. As you can see our day is very busy…. Next month we are looking forward to learning about the life cycle of a chick by hatching eggs in our class.